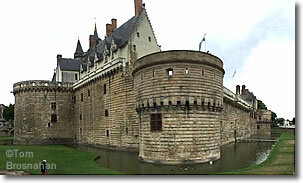 The largest city in Brittany, Nantes is known for its history, commerce, maritime trade, and liveability. Nantes, capital of the Pays de la Loire région and of the département of Loire-Atlantique (map), is the largest city in Brittany (Bretagne), and still considered by some to be the "capital" of that historic region. Château of the Dukes of Brittany, Nantes.